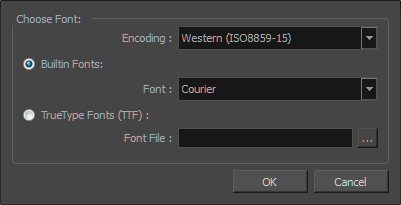 The Choose Encoding and Font dialog box lets you select the language encoding and embedded PDF font when exporting Unicode character to a PDF document. These will be used to display the text in a PDF. In the Export to PDF window, click New Profile. The PDF Profile dialog box opens. In the Font field, click the browse [...] button. Lets you select the type of Unicode encoding for the PDF. Lets you select any font installed on your system to use for all text in the PDF document. Lets you select a TrueType font for the PDF.